Work Smarter Not Harder! Let CRYODERM® and CRYODERM HEAT® do some of the work for you! Simply massage either product into painful areas and feel your clients muscle tension and pain melt away, saving your hands and body from undue stress helping you avoid repetitive motion injuries. Once applied both products stay lubrous and maintain just the right amount of drag to perform deep tissue, myofacial release, transverse friction as well as other modalities. CRYODERM Liquid Gel and CRYODERM HEAT® Lotion never ball up or exfoliate skin. Patients like to purchase a bottle to take home to help them manage pain and discomfort between massages. Additionally applying CRYODERM or CRYODERM HEAT® after and between massage aids in speeding up the body’s healing process making the massage more effective. Use CRYODERM exclusively in place of Lotions and massage oils on areas of the body that will experience over exertion during the event. This helps warm up the muscles by drawing blood flow to the area, releasing muscles for enhanced stretching and helps to reduce the risk of injury and cramping during the event. Help your athletes perform at an optimal level and enhance performance by pre treating them with CRYODERM pre event. Apply CRYODERM post-event to break the pain spasm cycle, create hyperemia, speed up the recovery and aid the body in its natural healing process. This will also help prevent next day muscle fatigue, pain and stiffness. Applying CRYODERM after cold therapy will enhance and prolong the cold sensation, while adding additional longer term anti-inflammatory, anti-bruising and anti-spasmodic effects to the treatment. 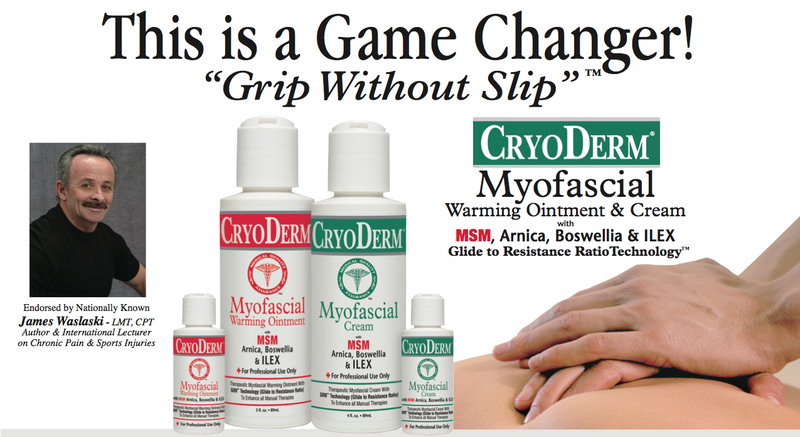 CRYODERM HEAT® may also be applied after cold therapy to create a contrast therapy. Due to the high strength of our products we do not recommend applying heat on the area that has been treated as it may cause excessive hyperemia, discomfort and potentially burn the patient. CRYODERM HEAT® may be applied five to ten minutes after the hot pack has been removed. This will enhance and prolong the warm sensation, while adding additional longer term anti-inflammatory, anti-bruising and anti-spasmodic effects to the treatment. For contrast therapy apply CRYODERM five to ten minutes after the hot pack has been removed. Suggest to your clients that they should purchase a bottle of CRYODERM or CRYODERM HEAT® for home use between massages. Clients will find that CRYODERM or CRYODERM HEAT® will help them manage pain and discomfort between massages. Applying CRYODERM or CRYODERM HEAT® at home between massages aids in speeding up the body’s natural healing process.